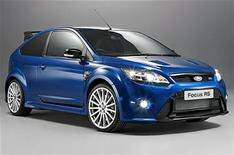 Ford Focus RS hits 300bhp | What Car? Ford has confirmed that its new Focus RS will develop 300bhp from its 2.5-litre petrol engine, giving it a 0-62mph time of 5.9 seconds. Ford had delayed announcing performance figures while it finalised the specification of the new car. It has now also said that the Focus will have 324lb ft of pulling power and a top speed of 163mph. The Ford Focus RS weighs 1467kg, and averages 30.5mpg, producing 225g/km of carbon dioxide. It will be sold with 19-inch alloy wheels as standard. The first cars are due to hit the road in March, priced from 24,995.